West Windsor, NJ – The first annual Mercer Indoor Row for the Cure took place on Sunday, February 26, 2017 at Peddie School’s Ian H. Graham ’50 Athletic Center. This is the only indoor Row for the Cure competition in the country. All proceeds from this event will go to breast cancer research supported by the Central and South Jersey Affiliate of Susan G. Komen located in Lawrenceville, NJ. 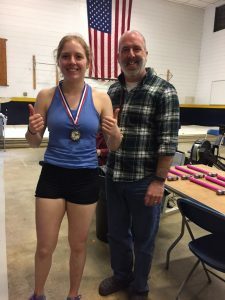 There were a total of 99 entries over 7 events including competitors from PNRA/Mercer, Peddie School, Navesink Rowing, Haddonfield, and Carnegie Lake Rowing. Winners of each event received a pink hammer. The Varsity Junior Women and Varsity Junior Men had the most entries with 32 and 26 competitors respectively. PNRA/Mercer Junior Emmanuelle Adamson won the 2000 meter race in a time of 7:15.3. Leila Shehab and Mia Barkenbush both of PNRA/Mercer placed 2nd and 3rd. In the Varsity Junior Men’s event, PNRA/Mercer rower Carter Levine won in a time of 6:10.3 followed by teammates Eli Kalfaian in 2nd place and Chris Silva in 3rd place. The Novice Junior events raced 1000 meters and PNRA/Mercer rower Sylvie Tuder won the Girls event in 3:53.6 with teammates Michele Granozio and Anna O’Neill placing 2nd and 3rd. For the Novice Boys, PNRA/Mercer rower Jake Bouldin won the 1000 meter race in 3:22.1 with Nick Cushman in 2nd and Will Griesinger in 3rd also from PNRA/Mercer. There were 4 competitors from the Trenton 9th Grade Academy Winter Erg Team. Ulises Quiñonez finished 14th out of 17 in the Novice Boys event. Marshella Thomas finished in 6th place out of 12 in the Novice Girls event with Trenton teammates Alisheh Mott and Rachel Marshall competing as well. The Coxswain event was also a 1000 meter race with three PNRA/Mercer coxswains fighting for the title and the pink hammer. Kate Takacs came from behind to win in a time of 4:28.8 with Caroline Galati a close second and Kira Sung in 3rd. There were two competitors in the Masters Men event – Steven Schultz of Carnegie Lake Rowing Association who won the race, and John McClatchy from PNRA/Mercer placing 2nd. PNRA would like to thank Peddie School for serving as the host venue, as well as USRowing, RegattaCentral, Row2K, Concept2, Row for the Cure, and the Central and South Jersey Susan G. Komen. The Princeton National Rowing Association, a 501(c)3 organization, operates the Finn M.W. Caspersen Rowing Center located on the shores of Mercer Lake, Mercer County Park in West Windsor, New Jersey. The Princeton National Rowing Association is dedicated to operating a world-class training site for our nation’s elite athletes, providing opportunities for area youth to excel in the sport of rowing and to expand rowing in the area through community-based programs. 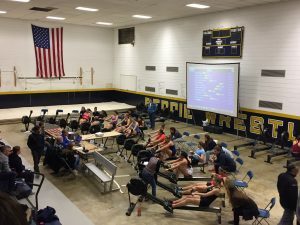 PNRA runs the Mercer Junior Rowing Program which provides rowing opportunities for youth from over 30 area schools and the Mercer Masters Rowing Program which provides rowing opportunities for adults. The center is a home to the USRowing National and Olympic Teams, as well as rowing clubs and schools. PNRA received generous support from Killarney’s Publick House, JLRacing, Bai, Holiday Inn, Courtyard by Marriott, and Residence Inn by Marriott.